After a perfect Week 11, Week 12 started with a thud on Thanksgiving with my under pick in the Eagles-Lions game and my bet on the Eagles defense bouncing back. With that Perfect was dead. We did get the Bears win in the night game so Week 12 starts 1-1 and hopefully we can follow up last weeks big week with another plus week this week. Also below in the Pit-Sea game I added a couple of new future bets on both teams. The Falcons are 1 and 4 in their last 5 and it seems really easy to take the Vikings winners of 4 of their last 5 her especially with them getting points. Despite the last 5 games I still have the Falcons rated slightly above the Vikings so getting them here under a FG is value. On offense, even though the Falcons were much better to start the season they still have an advantage over the Vikings in the pass game over their last 3 games. One reason why I think the Falcons pass game will have success against a good Vikings pass defense is that the Vikings rely on heavily on their pass rush, they average 13.2 pressure plays (S+TFL+QB Hits) per game. The Falcons offensive line has done a great job this year of limiting pressure giving up 9.7 Pressure plays per game 9th and they are 5th in Sack% giving up sacks on only 4.3% of plays. The Vikings obviously have a big advantage in the run game, averaging 4.9 yards per rush on the season and 5.8 over the last 3 weeks but surprisingly the Falcons run defense has been really good this year as they are giving up only 3.6 yards per rush on the season and 3.3 over the last 3 weeks. The Falcons have not been very good the last month and losing their lead RB is also a big blow but they are more than capable of beating a team like the Vikings especially if they can limit Adrian Peterson to just an ordinary Peterson day. For most of the week I wanted to bet the Giants, especially after both the Eagles and Cowboys lost on Thanksgiving, a win this week for the Giants would essentially give them the division. There was also a major issue in Washington’s secondary on Thursday with Chris Cullivers season ending injury giving the Giants top 10 pass game an even larger advantage but as a short road favorite getting 75% of the bets the Giants seems like a dangerous play. With the over we can still play the Giants offense which is 4th in yards per point, and 8th in passer rating even though they have not been healthy vs the 24th DVOA Wash defense which is even further depleted with the injury to Culliver leaving D’Angelo Hall as their best corner which is kind of gross. The Giants are averaging 35.7 points per game over their last 3 games and Manning has 10 TDs and 2 ints over that span. We also get the Wash home offense vs the struggling Giants defense. The last 2 weeks I have bet on Washington at home and against Washington on the road based on the dramatic home/road splits for the Wash offense. At home Washington is averaging 6 yards per play, a passer rating of 112.8, 7.5 yards per play and Cousins has 10 TDs with only 2 interceptions. Overall, Washington is averaging 27 points per game at home vs 17 on the road. The Giants defense has been getting worse as the season goes on, through the first 5 games the Giants were 13th in defensive DVOA and #1 vs the run giving up 3.5 yard per rush. They are currently ranked 20th in Defensive DVOA, 19th vs the rush and over their last 3 games things have really gone off the rails. Over their last 3 games the Giants are giving up 4.4 yards per rush,8.4 yards per pass att and an avg passer rating of 105.8. My numbers have The Giants as a top 10 offense and Washington is a top 5 home offense vs 2 of the worst 6 or 7 defenses in the league, I wouldn’t be surprised to see both teams get into the 30’s. The 26th and 28th DVOA offenses in this game and I expect the Eagles defense to have a big bounce back after last week’s debacle. The Lions are averaging 15.8 points per game over their last 3 and with the 30th ranked run game won’t be able to take advantage of the Eagles weakened LB group the same way TB did last week. The Lions defense has been much better the last couple of weeks holding both Oak and GB under 20. The Eagles offense is just devoid of big play makers and I think will need to grind out points. I was on GB last week and bet against the Bears and even though I won both bets I never felt really comfortable in either game. This just feels like too many points for the Packers to be giving and I think the fact that this is the last game on Thanksgiving is a big reason why as the books are shading this line up because they know betters will be on the favourite to either salvage a bad day early or double up on a good one. The Packers broke their 3 game losing streak and out up 30 points but the pass game still didn’t look right. Rodgers went just 16 for 34 for 212 yards. he did pass for 2 TDs with 0 Ints but overall not a very efficient game and not exactly a sign that the offense has fully righted itself in fact it wasn’t that far off of what we have seen over the last month. The Bears last week played the #1 defense in football the Denver Broncos and lost a tough one 18-16 where they had a 2 point conversion attempt to tie the game.6 of the last 7 Bears games have been decided by 3 points or less, they only one that wasn’t was a 37- 13 win 2 weeks vs the Rams. John Fox has made the Bears competitive week in week out so i don’t put a lot of stock into the historical Packers-Bears record, this Bears team plays very hard and their defense has been getting better and better as the season goes on. The Bears should be able to stay close and maybe even have a shot late for the upset. I found this weeks card very difficult, with so many games under a FG I found myself going back and forth on a lot of these games all week. In the end there were a few that really jumped out in terms of the numbers and those are the plays this week. This game opened at 6.5 and sharps bet it down, unlike previous weeks where I have laid off of a game because I missed out on the best number early in the week I am going to go ahead and take the Colts even at a lesser price. The reason is that the Falcons have shown over the last 5 games that they are capable of losing to anyone. In the Falcons last 5 games they have played Was, NO, TB, Ten and SF and despite playing 5 of the worst teams in the league the Falcons were 2-3 straight up and 0-5 ATS. The biggest surprise of the Falcons season when they started 5-0 was their run game, through the first 5 games they were 7th in the league averaging 4.4 yards per rush att. The run game allowed them to be balanced and very efficient on offense as they ranked 6th in offensive DVOA. They are now averaging 4.1 yards per rush att and are ranked 16 in offensive DVOA despite not playing any top 10 defenses in the last 5 games and in favt playing 2 of the bottom 3 defenses SF and NO. Even though Andrew Luck is out I don’t downgrade the Colts at QB this week for 2 reasons. Firstly the Andrew luck that has played this season has not been a major positive to the team, whether it was due to injury or something else, his passer rating of 74.9 is 30th in the NFL. In 2 starts Hasselback has a passer rating of 95 and with 2 fll weeks to prepare I expect Hasselback to have a very good game in Atlanta. The Colts still are favored to win the division and in their last 5 games they have faced much better competition than the Falcons playing the Patriots, Panthers and Broncos and putting up the same 2-3 record. This spread is kind of amazing 3 weeks ago I can’t imagine this spread would have been less then Den -6 but after 2 straight losses by Den and an impressive win last week by the Bears at St.Louis and the Broncos starting Brock Osweiler this line is basically a pick. Its hard to see how a change in QB can hurt the Broncos, they started the year 7-0 soley because of their defense. Despite 2 straight losses, they are still the #1 ranked defense by DVOA, they are equally good vs the pass (#1 in yards per pass att, #3 in avg passer rating agst) as they are vs the run 2nd in opp yards per pass attempt. Demarcus Ware will miss the game but Aqib Talib should be back. With Peyton Manning at QB the offense was dead last in DVOA and last in passer rating, its almost impossible for Osweiller to not be an improvement on that. Osweiler should be more mobile and able to run a truer version of Kubaik’s offense. The Bears defense is 28th in defensive pressure plays (S+TFL+QB Hits) so Osweiler should be able to have some time to make plays. The NFL betting market this week saw some very quick moves and getting the best of number really requires having your prep work done early in the week, its amazing how quickly numbers go off the board. The Panthers opened as 6 point favorites and honestly the only way I thought that line could move was towards 7 but by Friday it was basically 4 everywhere. Getting the best of the number really requires some a combination of early prep work and fortune-telling. There isn’t a lot statistically to think that the Titans are capable of playing the Panthers tough. The Panthers are certainly for real, now the #4 team in overall DVOA and #2 in defense while the Titans rank 24th. The only way the Titans can stay close and have a chance at winning is if the Panthers have a let down game here and I think situationally there is a case you can make that this is a spot that happens. Below is a look at the last 4 Panthers games. 2 of the games were in prime time where the Panthers rarely get to play, the Seattle game was a major playoff revenge spot and the Packers game was basically for #1 team in the NFC. The Indy game is the one with the least on the line and while they won straight up, they had to go to OT and they didn’t cover against a team that came in 3-5. This week, the Panthers play a losing team, on the road after 3 straight home games, outside the conference, it is literally the least important game they have played since week 1. As for the Titans, the defense has been very good this year ranking 9th in DVOA, and importantly for this game giving up 4.1 yards per rush (14th) but in the last 3 games only giving up 3 yards per rush. The offense has been very hit and miss under Mariotta and this is the concern here. He has been great in 2 games (TB,NO), pretty good in 2 others (Cle,Ind) and terrible in 2 (Buf,Mia). The 2 games he was terrible in were against easily the best defenses he has faced and neither is as good as Carolina, so that is a major concern here but if the Ten defense can keep Car close the hope is Mariotta can make enough plays to stay within a score and maybe pull out the win SU. Chicago is coming off of a very big comeback win on MNF vs the Chargers and now playing their second straight road game in St. Louis. The Bears are 29th in DVOA, 19th on offense and 28th on defense. The Rams are 14th in DVOA, 28th on offense and 5th on defense. There is no question the advantage the Rams defense has on the Bears offense, the Bears are averaging on 3.5 yards per rush in their last 3 games (3.9) on the season and Matt Forte will be out for his game, the Rams are 8th vs the run giving up 3.8 so they should be able to make the Bears 1 dimensional. Being 1 dimensional vs the Rams is a dangerous proposition, the Rams are 2nd in sack percentage (8.82% of plays) in total pressures per game at 16 per game, if the Bears cannot run that pressure will get to Jay Cutler. The Rams pass offense has struggled all year and in games where they fall behind or can’t get the run game going and have to pass they are not likely to get back into games. In this game I do not expect the Rams to have any issues getting their run game going. The Rams are averaging 4.9 yards per rush on the season (8th) and face the bears 2th run defense as they have given up 4.6 yards per rush, in the last 3 weeks its been even worse at 5 yards per rush att. Just the way it was drawn up, a last second TD for the Over and Win! Pure Unicorn Magic! 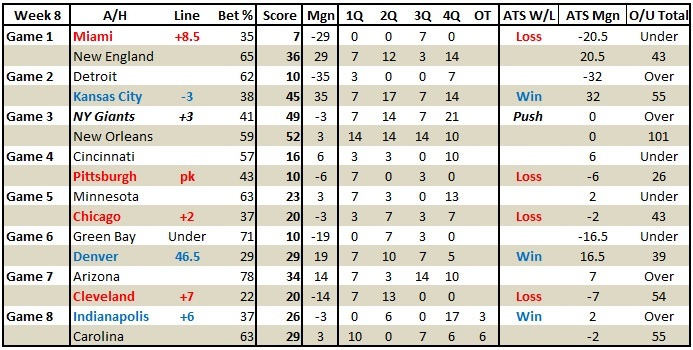 Totals – All 3 wins this week were totals and even though a couple were really close and one a near miracle, the game flow for all of the games was pretty much what I had hoped for. The Rams Vikings game went under even though it opened as the lowest total of the week and the game went to OT. Both those teams are built for unders week in week out. Dumb Luck, Sort of– The Giants–Bucs game was unbelievably lucky to go over with that last play of the game but really that game should have had no problem getting over. There was over 700 yards of offense in this games and 8 redzone trips, the Bucs went 1-4 in the redzone and there were some killer drops, Mike Evans had 6 drops himself which was a record according to ESPN Stats & Info. The Drops, RZ FGs and turnovers that kept the score down much lower than the game flow would have indicated. Betting against the Vikings– For the 3rd straight week I lost betting against the Vikings, who are now 7-1 ATS. Vikings continue to baffle, they are plus 28 in point differential and +22 ATS differential, so on average they are covering by about 3 points per game. In terms of efficiency they still rank low 24th overall in Weighted DVOA, 27th in Offensive DVOA but just keep covering. Square Teaser of the Week: Both sides of the teaser lost but really it’s the Atlanta- SF side that is the lesson here. Atl had basically 80% of the bets and I’m sure there was no game used in teasers more than that one because you could get them down to 1. Atlanta was never in position to cover and did have a shot to take the lead late when they drove down to the SF 5 yard line down 4 but a terrible call to go for the FG instead of going for it ended those hopes. Recent Trends Matter: We’re at appoint now where with 8/9 weeks in the books some of the teams look very different today than they did a month ago and definitely 2 months ago. I will use last 3 game 4 game trends a little more and full season trends a little less. Atlanta is a perfect example of why this is important, after starting the season 5-0 and 4-1 ATS their overall numbers are still very good but there has been a significant drop in their run game the last 3 games. Through 5 games they were averaging 4.4 yards per rush which provided a great balance to the passing game, on the season they are now at 4.1 yards per rush but over their last 3 games they averaging only 3.4 yards per rush which s 27th. They clearly haven’t been the same team the since their start and the huge drop in the run game has been why, the 3.4 in the last 3 games is more telling than the 4.1 overall. The Plinko Gods Giveth and the Plinko Gods taketh away. Last week in a really big week, there were 3 close games that could have gone either way and all went mine, this week there were 4 Sunday games that all looked good in the 4th Quarter and all 4 ended up going the wrong way. The 2 prime time games helped salvage the week and save me from disaster but not enough to save me from a terrible Sunday morning that felt like a kick in the mouth. London Mornings: The Lions went into the game as one of the worst defenses vs the pass and rush, 32nd in opp passer rating and 32nd in opp yards per rush att. The Chiefs didn’t have a huge day in the air but on the ground the Chiefs gained 204 yards on just 32 carries. The key to the game was the Chiefs getting an amazing 6 TDs in 7 RZ trips way above their season averages of 3.4 RZ trips and 41.7% TD conversions. The Broncos Defense: Took under 46.5 in GB – Den feeling that the GB offense had not been quite as good vs better defenses this year and the Broncos D was not only the best they had faces this year but was in fact the best in the league. This was maybe the best performance of the week, holding Aaron Rodgers to 77 yards passing. 4th Quarters : NFL Plinko has never been so cruel. In 3 of the 4 Sunday morning games (Pit-Cin, NYG-NO, Chi-Min) all 3 of my picks led the game midway or late in the 4th Q, the 4th game Cle-Ari had Cleveland leading at halftime and down 4 with the ball deep in Cardinals territory late in position to not oly cover but maybe take the lead outride. While watching the games I thought worst case I would go 2-2, 0-3-1 was crushing. The Giants Defense: When capping the Giants Saints game I mentioned how there was concern with the Giants Defense because they have basically lived off of turnovers sine the Amukamara injury. Against the Saints they had 1 Interception and the saints scored on literally very other drive, Brees finished with 505 yards and 7TDs. The game I am most upset about betting was the TNF Dolphins- Patriots game. While Miami had come in with 2 huge wins they were over the Titans and Texans, 2 teams that have been a mess all year and now we had a matchup between Dan Campbell and Bill Bellicheck on a short week with NE at home. This should have been a no play, we had no real indication of how Miami would look against a great team and the coaching mismatch was so large that really this one was just a hope and prayer. Taking a rookie coach, especially one who has never been a head coach before vs an all-time great on a short week is just a bad bet. I think in situations where you have either extra time to prepare or an extra short period of time to prepare these types of coaching mismatches matter more. The London games make betting very difficult because the travel adds factors that are impossible for us to handicap, teams rarely make regular trips and we have such small sample sizes that there isn’t a lot we can extrapolate from the previous games. I generally stay away from the London games for that reason but am going to take a shot this week and hope that the game plays as closely to regular game as possible. There are definitely some factors in this game that are impossible to predict. First and foremost, the game is being played in London and there is no way to guess how the travel will impact either of these teams. Secondly, the Lions fired their OC and and offensive line coach and we can’t really know if or how those changes will impact the Lions offense. Here’s what we do know, the Lions are 29th in DVOA while the Chiefs are 15th, The lions are -61 in point differential this year while KC is -8, The Lions are 32nd in opp passer rating, 32nd in opp yards per pass attempt. The Lions offense is also a problem, they have had no success running the ball (3.5 yards per rush) which allows teams focus soley on their pass offense. What’s interesting about his matchup is that while there is no more vanilla QB that Alex Smith, its’s the Chiefs who are averaging more yards per pass attempt than the Lions, 6.9 to 6.5 and their big play differential of -2 is much better than the Lions -21. The Chiefs were able to run the ball successfully last week for the first time since losing Jamal Charles and if that should continue against the Lions who are giving up 4.1 yards per rush. I continue to back the Giants week after week and it seems like I fade the Saints every week. The Saints are coming off of a big win last vs the Cots where Luck threw 2 interceptions in the first half that led to the Saints building a 20-0 lead that they would hold on to. I don’t think the Saints are good team and I do think the Giants are. With the saints favored by 3 what this says is that on a neutral these teams are even. I disagree. The Giants are 12th in DVOA while the Saints are 20th and the major difference is the Saints defense. The Saints are 27th in avg opp passer rating (102.2) 30th in opp pass yards per att (7.9) and 29th in opp yards per rush att (4.9). The reason the Saints have seemingly turned their season around with wins the least 2 weeks isn’t because their defense has greatly improved but rather because both Atlanta and Indy turned the ball over 3 times each and the Saints were +5 in turnovers in the 2 games. Last week the Colts outgained the Saints 6.2 to 5.4 in yards per play, in week 6 the Falcons outgained them 5.9 to 5.3. The Giants too have benefited from turnovers to win games as they are currently+9 on the season and the turnovers have certainly contributed to their defense looking better than they should but they still rank 18-20 in most defensive metrics like opp pass yards per att (20th) and opp yards per rush (18). The Giants are getting healthier on offense, ODB practised fully for the first time in weeks and they may have also found their running game last week with Darkwa.